Wir waren in Italien. Genauer gesagt waren wir in Chieti. Wir waren fünf Schüler und Schülerinnen mit unseren Begleitern Frau Stute und Herrn Wohlgemuth. Am ersten Tag ging es für uns morgens nach Düsseldorf. Von dort aus sind wir nach Rom geflogen. Nach einer mehr als zweistündigen Busfahrt in die Abruzzen wurden wir von unseren Gastfamilien in Chieti in Empfang genommen. Am zweiten Tag haben wir uns morgens alle in der Schule getroffen. Dort haben wir eine Rundführung und eine Vorstellung der Schule bekommen. 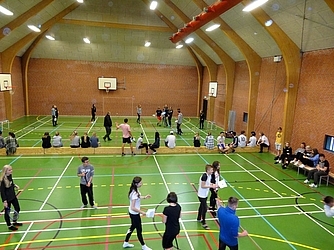 Danach haben wir uns als Gruppe besser kennen gelernt – durch ein Volleyball-Turnier, ein gemeinsames Mittagessen und der Besichtigung eines beeindruckenden alten Palastes. 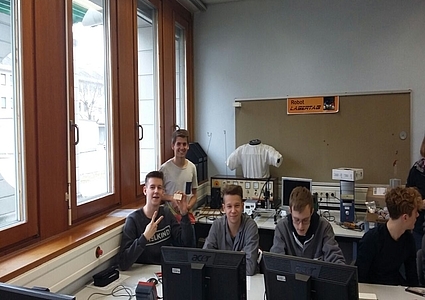 Am dritten Tag haben wir uns morgens wieder alle in der Schule getroffen, um an unserem Projekt zu arbeiten. 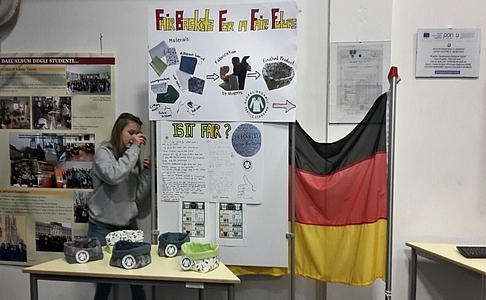 In diesem Projekt geht es darum, dass jede Schule ein faires Produkt herstellt hat und dieses dann mit Hilfe von Plakaten, die wir vor Ort gemacht haben, vor den Schülern vorstellt. 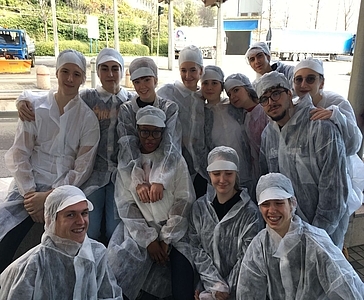 Eine Nähgruppe unserer Schule hatte Körbe aus fairen Stoffen selber hergestellt, die wir mit nach Italien genommen haben, um dort die Materialien, den Entstehungsprozess und die Kosten vorzustellen. Jede beteiligte Schule konnte am Ende einen Korb mit nach Hause nehmen. Am vierten Tag sind wir morgens mit dem Bus zu einer Nudelfabrik gefahren. Dort haben wir uns die Herstellung von Nudeln angeschaut, das war super interessant. Im Anschluss daran haben wir ein Picknick gemacht, um uns alle noch besser kennen zu lernen. Nach diesem schönen Picknick sind wir in eine kleine Stadt gefahren und haben in einem Café etwas getrunken und gegessen. Zum Abend ging es dann wieder zurück nach Chieti. Am darauffolgenden Donnerstag haben wir in der Schule unsere fairen Produkte vorgestellt. Schüler von der ganzen Schule kamen, um sich unsere Sachen anzugucken und uns zuzuhören. Da dies unser letzter gemeinsamer Abend war, trafen sich abends alle Schüler und Schülerinnen vom Austausch in einem Restaurant. Dort haben wir alle zusammen gegessen. Am Freitag folgte unsere Abreise. Allerdings sind wir nicht direkt nach Dortmund zurück gefahren, sondern nach Rom, wo wir noch einen Tag und eine Nacht verbracht haben. Morgens am 10.3. ging es dann zum Flughafen und von dort aus nach Düsseldorf. Wir sind uns alle einig, dass wir eine schöne Zeit in Italien hatten. Wir haben neue und nette Menschen aus den verschiedensten Ländern kennengelernt und sind dankbar, dass wir an diesem wunderbaren Projekt teilnehmen durften. Our project week started with a very warm welcome at school. Teachers, students – everybody was happy to see each other again! After having lunch we got to know Klagenfurt by walking around and answering all the questions of an interesting city rally. One of our highlights was our trip to Graz. This city with its old buildings and historical places was very impressive. But even more unforgettable is Thursday. 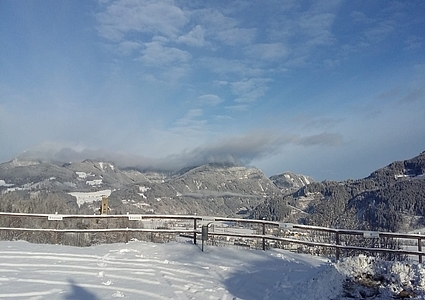 It was a cold, sunny and snowy Thursday morning when we started our trip to Friesach where we visited the Chocolate Factory Craigher. 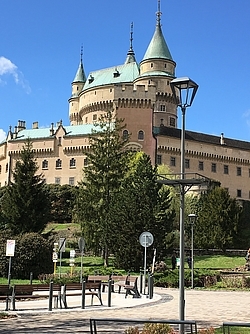 First we had a walk through the city of Friesach and to the castle Petersberg. Walking through 5 cm of fresh snow – fantastic! Up the hill we had a fantastic view, that’s why we took many pictures . Besides, we had a snowball fight. It was a perfect day and most of us felt happy because we have never experienced that much snow before. Our time at the chocolate factory was also great. It is a family run company and it is older than 100 years. The son has received a special certificate for making chocolate. First, we entered the coffee shop and restaurant where we could taste and buy hand-made products. In the back of the factory there is a museum where we could enjoy their products and learn about their production. We really loved tasting different kinds of chocolate and we were surprised how many types and flavors there were. Then we went to the lake of Wörther where we had lunch in the Pyramidenkogel. It is a tower of 70 meters height and from the top you have a fantastic view across the whole area with the big beautiful lake. To go down we could use the long slide which was very fast and amazing. The fantastic day ended with a workshop in which we had to design chocolate wrappings. Unfortunately time runs fast. After enyjoying a trip to Minimundus – we had a tour around the world in just some hours – we went back to school on Friday. There we got our certificates and enjoyed the rest of the day with our friends and families. We won’t forget this week. 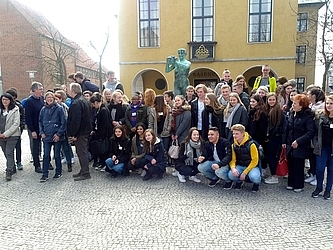 Our first day in Handlova began with a visit to the town hall. We were greeted by the Mayor who gave a short speech of welcome. We each received a guide book from the town and pen as a memento. We were also invited to enter our names in the town’s guest book. From there we visited the local school. Here we were shown around and each visiting contingent gave a presentation introducing their home town to the other delegations. After lunch in the school’s canteen we visited the “Carpathy” Art Gallery, an arts and crafts workshop, where we spent some time making hearts from cloth. We also visited the “Haus der Karpaten-Deutschen”, where a rather elderly Lady described life in Handlova during the time when it had a substantial ethnic German community. We were treated to drinks and biscuits before we moved on to our next destination, the Mining Museum. There was an interesting display of mining equipment through the ages and after a tour of the exhibits we were shown a film describing the life of miner’s workers and how dangerous their job could be. Again we were invited to sign the guestbook. We spent what remained of the day with our Slovakian host families. 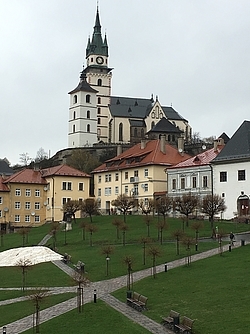 In the morning the delegations re-grouped in the centre of Handlova in order to meet the bus which was to take us to Trenčín castle. After climbing a steep path to reach the castle we were given a guided tour during which the history of the castle was explained. After the tour of the castle, we were dispatched in groups into the town. 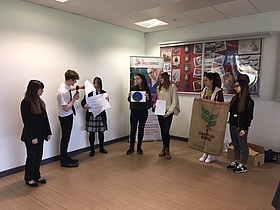 As part of a competition each group was tasked to take a photograph of the group with a Fair Trade product. We then had some time to do some sightseeing in the town. The town was rather picturesque especially the old town which reminded me of Münster. At the appointed time we all met again at the bus and where driven to a shopping mall where we had a couple of hours to browse around the shops. In the late afternoon we returned to Handlova and spent the evening with our host families. An early start! We met again in Handlova’s town centre at 08:00. From here we were taken to a Fair Trade Farm. 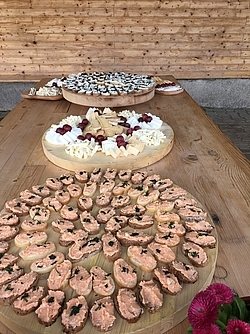 The farm specialises in the production of cheese, predominately made from the milk produced by the sheep which are kept by the farmer. We were shown every step of cheese production from the milking of the sheep to the end product. It was a very interesting tour and we were encouraged to take part in some of the activity. Cows and goats are also kept on the farm and because of the time of year there where, of course, lots of lambs. We ate lunch on the farm, noodles with a cheese sauce, all naturally made with produce from the farm. The produce from the farm is only sold through outlets in the region at a fair price both for the farmer and for the local consumers. During the afternoon we had the opportunity to see the rest of the farm and for those who so wished even to ride the horses. We left the farm with a small gift of locally produced cheese and drove on to our next stop, a glass museum. Here we were introduced to glass blowing, a dying trade in the region. After a fascinating tour we were given the opportunity to try to blow a glass. I bought a souvenir. 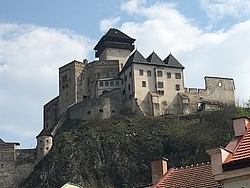 Today’s programme was a visit to another castle, this time to the castle at Bonica, believed to be one of the most beautiful castles in Europe. The castle dates from the 12th century its catacombs even contain a wonderful stalactite cave. After a traditional Slovakian lunch the winners of the fair trade group photograph competition which took place on Tuesday were announced. I am not sure who won, but I wasn’t among the winners. We spent the afternoon at the local zoo and shopping in Prievidza before returning to Handlova and our host families. Another early start! We set off for Kremnica at 08:00 for a day of sightseeing. We visited two museums both concerned with money. In the first we learned about the historical development of Slovenian money including the development of banknotes until monetary union and the introduction of the Euro. The second contained machines which were used for the minting of coins and the production of banknotes from the historic to the modern. During the afternoon we said farewell to the English delegation that had to travel back earlier and the remainder of the party visited a historic church. The church was very old and had been restored following a fire. After climbing an endless stairway we finally reached a viewing platform from which we had a wonderful view of the town, the surrounding forest and the mountains in the distance. In the church we listened to someone was playing the organ and a guide told us something of the church’s history and it’s renovation following the fire. We spent this, our last evening in Handlova together with the other delegations. Tag 1: Flug von Dortmund nach London. Fahrt mit dem Minibus nach Peterborough. Ankunft in unseren Gastfamilien. Day 2: On the second day we heard some presentations about what kind of projects everyone had done in the last year. Then we heard a presentation about how we could make a digital map with a computer page, where the Fair Trade shops or restaurants are in our city. And then we started to design this fair map. Tag 2: Am zweiten Tag haben wir zunächst einige Präsentationen über das, was jeder im letzten Jahr an Projekten im jeweiligem Heimatland gemacht hat, angehört. Dann hörten wir einen Vortrag darüber, wie wir eine digitale Karte mit einer Computerseite erstellen können, wo die Fair-Trade Läden oder Restaurants in unseren Städten eingetragen sind. Und dann haben wir diesen Plan begonnen zu erstellen. Day 3: On the third day we did a business challenge. We worked in little groups and every group got a coffee bag and had to create a product out of this this bag. Then we had to plan how to make profit and found a logo and a name and how we could help the people in other countries. And at the end we presented our ideas and the best group got a fair price. 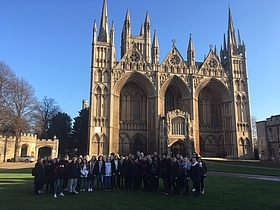 At last we visited the famous cathedral of Peterborough. 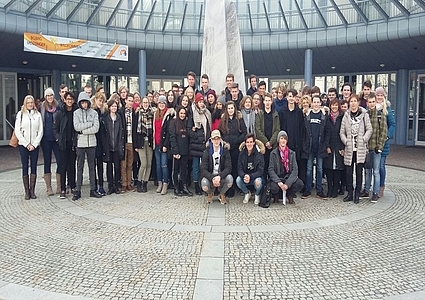 Tag 3: Am dritten Tag haben wir eine sogenannte Business-Challange gemacht. Wir waren in kleinen Gruppen und jede Gruppe bekam einen Kaffeesack und mussten sich ein Produkt überlegen, welches wir aus diesem Jutesack herstellen könnten. Dann mussten wir planen, wie wir Gewinn machen könnten und ein Logo finden und einen Namen, sowie wie wir den Menschen in anderen Ländern damit helfen könnten mit Hilfe unseres Einkommens. Und am Ende präsentierten wir unsere Ideen und die beste Gruppe erhielt einen fairen Preis. Später haben wir die berühmte Kathedrale von Peterborough besichtigt. 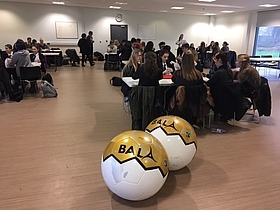 Day 4: On Wednesday we heard a presentation about fair Trade Football and saw a film about the production of footballs in a poor country . Then we tried to do our own football. At last we played a game in little groups. Every group was a poor family in a developing country and tried to survive selling oranges. Tag 4: Am Mittwoch hörten wir einen Vortrag über Fair Trade- Fußbälle und schauten einen Film über die Herstellung von Fußbällen. Dort hat eine Frau aus einem ärmeren Land einen Fußball nur aus alter Zeitung und Plastik Tüten hergestellt. Dann versuchen wir, unseren eigenen Fußball auch so herzustellen. Zum Schluss spielten wir ein Planspiel in kleinen Gruppen. Jede Gruppe war eine arme Familie und musste versuchen zu überleben. Wir bastelten Orangen und versuchten diese zu verkaufen, um das harte Leben einer Familie, die ums Überleben kämpft, zu demonstrieren. Day 5: On Thursday we were in the Warner Brothers Studio in Watford, London. There we visited the Harry Potter World, this was very interesting and exciting. Tag 5: Am Donnerstag waren wir in den Warner Brothers Studios in Watford, London. Dort haben wir die Harry Potter World besichtigt, dies war sehr interessant und aufregend. Day 6: On Friday we visited Cambridge. 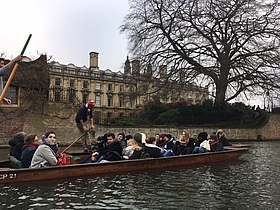 We had had a pounding tour on the river Cam and saw the old colleges, bridges and parks. Tag 6: Am Freitag machten wir einen Ausflug in die berühmte Universitätsstadt Cambridge. Wir machten eine Bootstour auf dem Fluß Cam und sahen dabei die alten College-Gebäude, Brücken und Parks. Nach Dänemark sollte es also gehen. Mit hohen Erwartungen nach dem spannenden Projekt im Dezember 2015 in an unserer Schule Deutschland fuhren wir, d.h. fünf Schülerinnen und Schüler aus dem 9. und 10. Jahrgang sowie Frau Riedel und Herr Scheer vom Erasmus-Team, nun nach Dänemark. Um genauer zu werden: es ging nach Sønderborg, einer kleinen, sehr schönen Stadt nahe Flensburg. Nach unserer Anreise am Sonntag, dem 3. April 2016, ging es am Montag mit dem Programm los. Zuerst wurden wir total nett und herzlich vom Schulleiter begrüßt. Nach langem Sitzen ging es sportlich weiter mit einem First World vs. Third World-Hockey-Spiel. Dieses hat uns geholfen, uns gegenseitig kennenzulernen und hat uns gleichzeitig noch einmal die Ungerechtigkeit der Welt symbolisiert, da einige Spieler moderne Schläger hatten und andere nur ungeeignete Gegenstände als Sportgerät. Nach dem Lunch ging es zu einer spannenden Diskussion mit dem Bürgermeister. Anschließend machten wir uns in Sønderborg auf Fairtrade-Suche. Obwohl es meiner Meinung nach mehr Fairtrade-Produkte in Dortmund gibt, wurden wir auch in Sønderborg fündig. Diesen Tag fand ich schon sehr vielseitig, aber gleichzeitig auch anstrengend. Der Dienstag war mein persönlicher Lieblingstag. Wir spielten ein Spiel, teils virtuell am Computer, teils real in der Schule. Wir stellten den weltweiten Kaffeehandel nach. Ich war ein Farmer, sicherlich eine spannende und interessante Rolle. 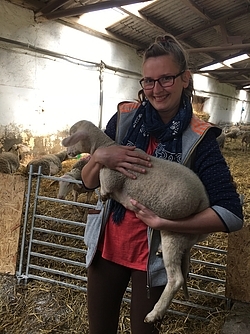 Bei uns Farmern ging es anders als bei den Verkäufern mehr um das Überleben als um den Profit. Dieses Spiel hat mir gezeigt, wie schnell Kaffeepreise steigen und sinken. Auch hat es mir klar gemacht, wie wenig Erlös die Bauern bekommen und dass es ein risikoreiches Geschäft ist. Das wichtigste war aber die Erkenntnis, dass wir Verbraucher – im echten Leben - den (echten) Bauern wirklich helfen können, wenn wir Fairtrade-Produkte kaufen. So konnte ich im Spiel in meiner Rolle als Farmer nur dank Fairtrade überleben. Am Mittwoch war es mindestens genauso spannend. Wir besuchten Danfoss und den Themenpark. Danfoss ist eine große Firma, in der wir – nach kurzer Einführung - die Produktion verfolgen konnten. Zusätzlich hatten wir die großartige Möglichkeit, Mitarbeiter der Firma zu den Produktionsbedingungen zu befragen. Hierbei war für mich am interessantesten, dass die Firma zwar garantiert, dass es keine Kinderarbeit gibt, dieses aber nur für die direkt Beschäftigten gilt, jedoch nicht für die Zulieferer. In dem Themenpark konnte man Sachen erfinden und Segway fahren. Am darauffolgenden Donnerstag versammelten wir uns in der Schule und hörten eine Präsentation über Fairtrade. Anschließend wurden wir in Gruppen eingeteilt und gestalteten eigenständig Präsentationen, die wir dänischen Schülern vortrugen. Am Abend gingen wir gemeinsam zu einem Konzert. Freitag reisten wir nach Ribe, einer schönen alten Wikingerstadt. Zuerst aber besuchten wir einen Bauernhof, der Bio-Milch produziert. Wir diskutierten, warum man „bio“ produziert und was dies mit Fairtrade zu tun hat. Der nächste Programmpunkt war das Wikingermuseum. Anschließend ging es zu einer Stadtrundführung durch Ribe. Die Stadtführung fand ich sehr interessant, da die Spuren der Geschichte in der Stadt deutlich sichtbar sind. Nach einem spannenden und anstrengenden Tag ging es nach Hause, d.h. zu meiner Gastfamilie. Am Abend trafen wir uns alle in der Schule wieder und aßen Dänische Spezialitäten. Am Samstag ging es per Zug zurück nach Dortmund. Alles in allem habe ich nicht nur in Dortmund eine interessante Zeit gehabt und neue nette Menschen kennengelernt, sondern auch in Dänemark! 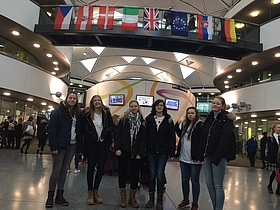 Ich wünsche allen Schülerinnen und Schülern des Erasmus-Teams, dass sie in den kommenden Schuljahren ebenso spannende Wochen an unseren Partnerschulen in England und der Slowakei (2016/17) und Italien und Österreich (2017/18) erleben können. 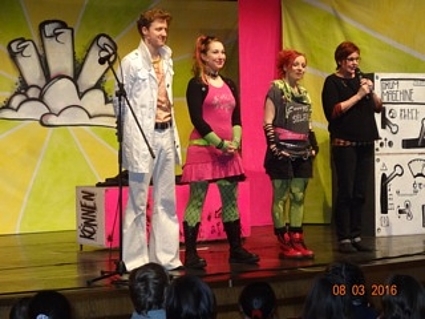 Am 08.02.2016 haben wir uns das Punk-Musical „Global Playerz“ angeschaut. Es handelt von der globalen Gerechtigkeit und der Verantwortung beim alltäglichen Lebensmittelkauf. 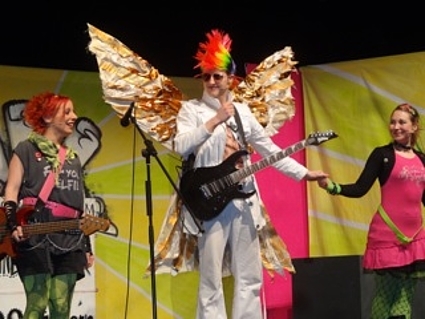 Punk „Skazz“, Nia und Katey bilden das Punk-Trio „Global Playerz“, das zu einem Auftritt beim „Hot Music TV-Song Contest“ eingeladen worden ist. Während Katey in Ghana ihre Familie sucht, stellen Skazz und Nia die Band in einem Song vor. Skazz, die aus einer Hartz-IV Familie kommt, sieht in der Band eine Art Ausflucht, während die verwöhnte Nia, deren Vater ein reicher Unternehmer ist, die Band als ihre Möglichkeit, an Ruhm und Erfolg zu kommen, sieht. Als die beiden Bandmitglieder Katey anrufen, um ihr zu sagen, dass sie sie für den Song Contest brauchen, erzählt Katey, dass ihre Familie nicht mehr in dem Dorf lebt, in dem sie einst ihre Hütte hatten und dass an der Stelle des Dorfes eine Plantage für Kakaobohnen sei. Skazz und Nia schenken dem vorerst keine Aufmerksamkeit, bis sie von Katey hören, dass ihre Familie jetzt in einem Slum lebt und erfahren, wie die Bedingungen dort sind. Als die beiden herausbekommen, dass die Plantage Nias Vater gehört, wird den beiden bewusst, was für Probleme das Unternehmen von Nias Vater für die Menschen in Afrika bringt. Als Nias Vater sie bittet, in dem Song für den Song Contest den neuen Schokoriegel seines Unternehmens zu bewerben, konfrontiert Nia ihn mit den Problemen, die er verursacht. Ihr Vater weist die Anschuldigungen von sich und droht damit, die Finanzierung der Band einzustellen, wenn sie nicht das tun, was er will. Nachdem sich Nia und Skazz getritten haben, entscheiden sie sich doch dafür, beim Contest ihren eigenen Song vorzustellen. Am Abend der Vorstellung führen Skazz und Nia einen Song über die Probleme in Afrika auf und gewinnen damit den Contest. Bei uns Schülerinnen und Schülern aus den 7. - 9. Klassen kam das Theaterstück gut an. Wir waren von der Aufführung sehr beeindruckt. Die Europaschule Dortmund lebt erfolgreich Europa im Kleinen– möglich macht dies ein von der Europäischen Union gefördertes Erasmus-Projekt. Das Thema „Fair Trade for a fair future. Global Consumer Conscience” beschäftigt seit Beginn dieses Schuljahres Schulen in sechs europäischen Ländern. 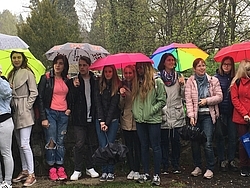 Zusammen mit unserer Schule werden sich Schülerinnen und Schüler aus Dänemark, England, Italien, Österreich und der Slowakei drei Jahre lang mit der Entwicklung eines weltweiten Bewusstseins als Konsumenten beschäftigen. Für die Europaschule ist es ein großes Glück, an diesem europäischen Projekt teilnehmen zu können, da es ihre beiden Schwerpunkte „Europa- und Fair Trade-Schule“ verknüpft. Im Verlauf der kommenden drei Jahre werden sich die beteiligten Schulen sechsmal in einem Partnerland treffen, um mit jeweils 50 SchülerInnen und den begleitenden LehrerInnen am Thema zu arbeiten. Diese Arbeitseinheiten sowie die Vor- und Nachbereitungen vor Ort werden in einem jährlich stattfindenden Lehrertreffen geplant. Das erste große transnationale Treffen fand in der ersten Dezemberwoche in Dortmund statt. 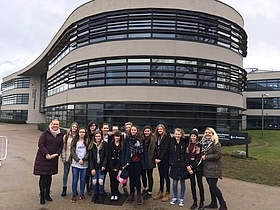 51 Schülerinnen und Schüler und ihre 17 Lehrerinnen und Lehrer verbrachten sieben spannende und arbeitsreiche Tage mit der Erarbeitung des Themas in Workshops, mit Besuchen von Fair Trade- Institutionen und Weltläden in Dortmund und Umgebung und mit einer Stadtrallye, bei der es Geschäfte zu finden galt, die Fair Trade-Produkte in ihrem Sortiment bereithalten. Die Schülerinnen und Schüler kochten gemeinsam ein Mittagessen mit Zutaten aus fairem Handel, das mit Kuchen und Pralinen seinen Abschluss fand. 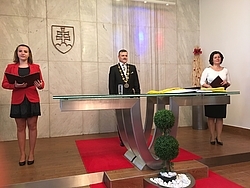 Der Höhepunkt der Projektwoche war der Empfang bei Bürgermeisterin Birgit Jörder im Rathaus unserer Fair Trade-Stadt. 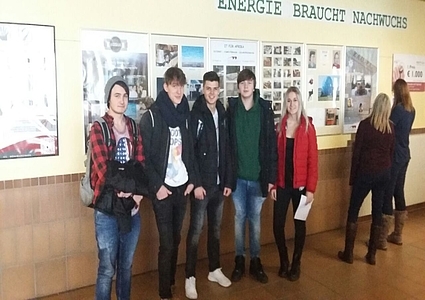 Europaschüler der Jahrgänge 7 – 10 waren Gastgeber für die europäischen Besucher und erlebten eine interessante Zeit mit ihren Altersgenossen in der Schule und in ihrer Familie. Viele Vorurteile konnten über Bord geworfen werden. Kommunikation gelang über Nationalitäts- und Altersgrenzen hinweg. Samuel, 13, einer der jüngsten Dortmunder Teilnehmer, war sehr beeindruckt, dass beim Abschied geweint wurde. Für ihn wird der Kontakt zu Stefano aus Italien nicht abbrechen. Auch sein gleichaltriger Mitschüler Joshua genoss die gemeinsame Zeit und fragte umgehend, wann die nächste Projektwoche geplant sein. Alle beteiligten Schülerinnen und Schüler freuen sich auf die kommenden Reisen zu den Arbeitstreffen in den Partnerschulen, an denen sie in Delegationen zu jeweils fünf Personen teilnehmen dürfen. Das nächste Treffen findet in der Woche nach den Osterferien in Dänemark statt. Für 2017 stehen Österreich und die Slowakei auf dem Plan. 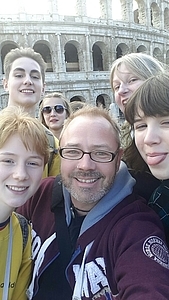 Italien und England runden unser Reise- und Arbeitsprogramm ab. Fair Trade steht an der Europaschule schon seit Langem ganz oben auf der Agenda. Der Blick wurde durch die gemeinsame Arbeit jedoch noch einmal für Fair Trade in unserer Stadt geschärft. Unter den Europaschülern gibt es seitdem einen unausgesprochenen Wettbewerb, in welchem Geschäft der Stadt man welche fair gehandelten Produkte gefunden hat. Jana, 12, sucht bekannte Supermärkte regelrecht nach diesen ab, um anschließend ihre Erfolge auf unserer gemeinsamen Erasmus-Plattform zu verkünden.